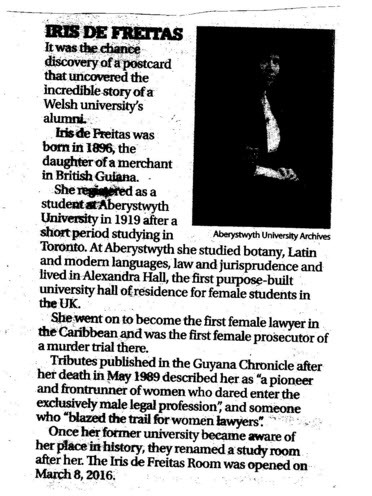 Attached is a scan of an extract from a newspaper article regarding Iris de Freitas. Her father was M G de Freitas from Demarara, she was a barrister and lived at Georgetown. I do not believe that Iris was from our "branch". The issue is that a few "de Freitas" (of Freitas) familes from Madeira went to BG as indentured persons. Their families originated in a place in north Portugal called and ruled by a "Freitas" before moving to Madeira if I understand it correctly. So it all gets very confusing. Iris de Freitas Brazão was my mother's great friend. 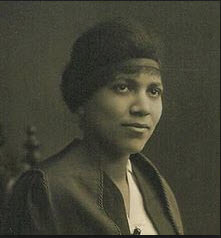 She was the first lady lawyer in the Caribbean and British Guiana. Her father was a merchant and came to British Guiana when labour was needed on the sugar plantations after the end of slavery. England and Portugal had a centuries old "understanding". He sold sweets. Remember "never- done sweetie"? He also sold cocoa sticks for making cocoa "tea". Madeirans also went there in search of gold. The famed lore of Eldorado. Auntie Iris' mother was Barbadian as her father also did business in that island. de Freitas is a very common name in Madeira but not so on the Continent. Iris de Freitas is not at all related to your family nor to mine. She married Alfred Brazão, Aunt Laura's brother. Auntie Iris was working at Government House as a secretary/ receptionist. Alfred Brazão went there for some reception and met her. They conversed; became friends and he said to her one day 'If I were the marrying kind, I might marry you' to which she replied 'And if I were the marrying kind, I MIGHT marry you.' They never had any children. Actually I quoted this in an article I did about her for a Guyanese newspaper some years ago. She lived at 69 Brickdam. Iris Brazão was clearly coloured and in those days there was prejudice. My mother was not in to that, and as they had much in common, they were friends. When Uncle Fred died alone in a London hotel of a heart attack, (he smoked) Auntie Iris was so grief-stricken that she came to live with us on Murray Street for 6 months. He had gone to London as they were going to make him Attorney General.